These days time runs short in our family so making quick meals are a priority which means I often find ways to speed things up a notch. The other day we created a Crock-pot Mexican Chicken with Vegetables (coming soon to the blog) and this Apple-Cinnamon Chicken Rice with Raisins as a side-dish. We aren’t fans of buying quick cooking rice in boxes or packets so I thought I would try cooking my chicken rice dish right in the rice cooker to see what would happen. Voila, it turned out fluffy and perfect! Over the years I’ve always added different oils and herbs to the rice cooker with success so I did that for this chicken rice recipe but then added a few more spices that I haven’t tried before. I always start by soaking and then rinsing the rice in luke-warm water to get some of the starch off and then add it to the rice cooker. I cover the rice with cold water in equal amounts to the rice then add turmeric, cinnamon, onion powder, 1/3 cup chopped red onion, lime juice, salt, pepper, chives and cumin. Once the rice cooker finished I let it stand on warm for a minute or so. At this point you can add sesame oil or extra-virgin olive if you’d like or add it to the rice cooker before you cook the rice. I decided not to use any oil for this recipe. While the rice was finishing up I added about a 1.5 tablespoons of low-sodium chicken bouillon mix (approx 2 cubes) to a cup and added about 1 cup of water. Taste your broth for proper consistency in flavour depending on the product you use. Add more water if you need to. I fluffed the rice in a glass bowl where I slowly poured the chicken broth little by little so the rice would absorb it. Then I sprinkled raisins and chopped apples for texture and a sweet flavour over the top and mixed them in. Lastly, I cut a bunch of fresh parsley from the pot we have sitting in our kitchen window, chopped it and mixed it in the chicken rice. You can also sprinkle a bit more cinnamon over the top to add a bit more foodie flair to the dish so that your guests will think you spent hours making it. I didn’t add chicken since we were serving the Apple-Cinnamon Chicken Rice with Raisins as a side-dish for our crock-pot Mexican Chicken and Vegetables. If you want to add cooked chopped chicken breast I would do that before you add the chicken broth. This chicken rice turned out perfect and it was done all in the rice cooker which was great and is bursting with a beautiful yellow colour. Normally I make a garlic, lime, ginger, sesame oil rice which takes a bit of time. It’s done in the rice cooker then fried so there are more dishes to clean up and more effort required. So, depending on how long it takes your rice cooker to cook up 1.5 cups of rice you can have this side-dish ready to go in about 20 minutes. Brilliant! 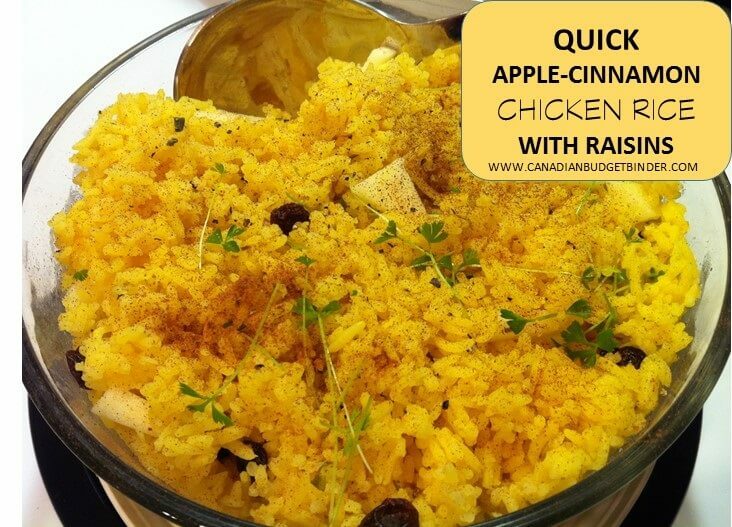 Enjoy this easy apple cinnamon chicken rice with raisins as a side-dish for just about any meal or on its own. Wash your rice a couple of times with luke-warm water to rinse away as much starch as you can then put into the rice cooker. Add in equal parts water and make sure the rice is covered with water. When the rice is done add in the chicken stock (if you want to add chicken breast add it first before the chicken stock) Mix little by little as you add the stock slowly so the rice absorbs it. This short-cut apple cinnamon chicken rice recipe was a hit in our house and I’m sure I’ll be making it again and again. If you are worried about the raisins being too hard just let the rice do the work with the residual heat as it warms everything up. You could also cover the rice when it’s done to let the heat circulate even better to moisten up the raisins and warm the apples through. It doesn’t get any easier than that for delicious home-cooked rice. This does look yummy!! Wonder how it would taste with pork? Might have to try that…. Rice is so versatile to cook with as you can add just about anything to it and it still tastes good! Makes yummy leftovers too!